In just 30 seconds, a devastating earthquake like the ones that struck Japan and Ecuador can render a city helpless. With roadways split and bridges severely damaged, residents and emergency personnel could be prevented from moving around to rebuild. Normally, it takes weeks to repair the cracking or spalling of columns on just one bridge damaged in an earthquake. 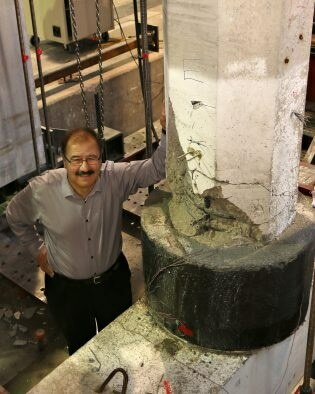 But a team of researchers led by University of Utah civil and environmental engineering professor Chris Pantelides has developed a new process of fixing columns that takes as little as a few days. This process is outlined in a new paper published Thursday, April 28, in the most recent issue of the American Concrete Institute Structural Journal. In an earthquake, a bridge is designed to take the brunt of the damage at the top and bottom of the vertical columns where they meet the foundation and the horizontal beams. If a bridge survives from collapsing but the columns are damaged, it is likely too unstable to be driven over. And if several of the steel rebar in the columns have snapped, the bridge likely cannot be repaired at all and must be torn down. But if the columns can be repaired, engineers typically chip away at the concrete, replace any bent rebar and steel hoops inside and then pour new concrete into a steel cast that’s built around the column. That’s a lengthy process that leaves the bridge unusable for weeks until the repair is finished. Pantelides’ quicker and more cost-effective process involves creating concrete donuts known as “repairs” that are lined with a composite fiber material built around the bottom and top of each column. The material is a carbon fiber-reinforced polymer made of fibers and resin that is stronger than concrete and steel. First, a number of steel rebars with heads are drilled into the foundation around the column and secured with an epoxy. Then two halves of a circular shell made of the composite fiber (that are just millimeters thick) are placed around the column and rebar and spliced together. Concrete is poured around the column and over the rebar with the composite fiber acting as a mold. The result is a repaired column with approximately the same structural integrity as the original column, Pantelides says. The process also could be used to retrofit bridges to make them more earthquake-safe, though it was specifically designed for repair. And it’s not limited to repairing just bridges. The procedure also can be used on damaged columns around a building. Pantelides and his team have filed patents on the process, and he says it can be utilized by construction companies on earthquake-ravaged areas immediately. The research was funded by the Utah, New York and Texas departments of transportation and the Mountain Plains Consortium. The co-authors of the study are University of Utah civil and environmental engineering doctoral students Joel E. Parks and M.J. Ameli, and Dylan N. Brown, a bridge engineer at Michael Baker International in Madison, Wisconsin.